This graphic novel is full of so much win. It is hard to know what to include and what to leave out of this post, because I don’t want to spoil the joy of reading and discovering things for yourself. The art is wonderful. No stereotypical musclebound heroes or mostly naked impossibly shaped women here, for instance. There’s the right level of detail and variety in page layouts. I was glad it was in color, as the palette choices really added to the story. The story is fantastic, in both the “it was highly entertaining” and “there are dragons and people wear cloaks” kind of way. The pacing and the plot just work. It is also very funny. Some of the character names are delightfully almost too much: Lord Ballister Blackheart and Sir Ambrosius Goldenloin. Yeah, just guess who is the hero and who is the villian… but don’t bet money on it. Maybe. So, you should probably just click on over to Noelle Stevenson’s website and/or stop in at your local bookstore and buy it. 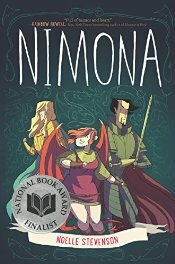 They should have it; Nimona was a National Book Award finalist. It is absolutely worth it. Highly recommended.